Block available dates of a rental. It is not a booking, it only prevents from customers reservations. Delete a blocking. Sometimes the owner of a rental desires to dispose of his own property. 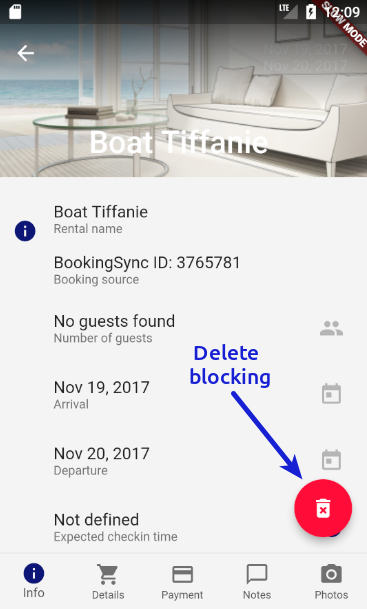 Or simply, a rental manager needs to block a rental during some days to prevent from any customer booking. This is possible with Rental Ninja mobile app. 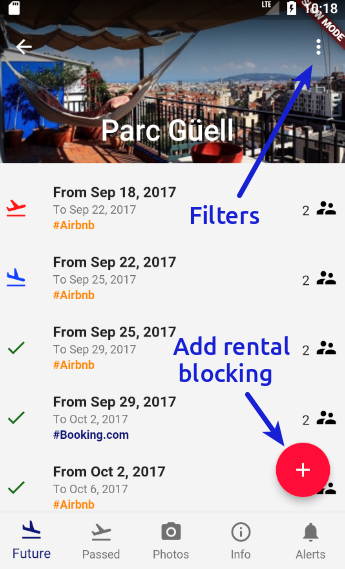 To do so, go to the rental that you want to block via the rentals view (directly available from the main menu). Once in the rental view, go to the future or passed bookings tabs and click on the "+" button. Enter the dates and notes and click "save". Only the available dates of that rental will be selectable. Then the blocking will be automatically added. To delete a created blocking, find his booking view (picture below) and while you are on the info tab, you will see a rubbish bin icon. Use it to delete the rental blocking. You will only see the icon if you are eligible to delete it. This means that will only be displayed if it is a blocking you created.